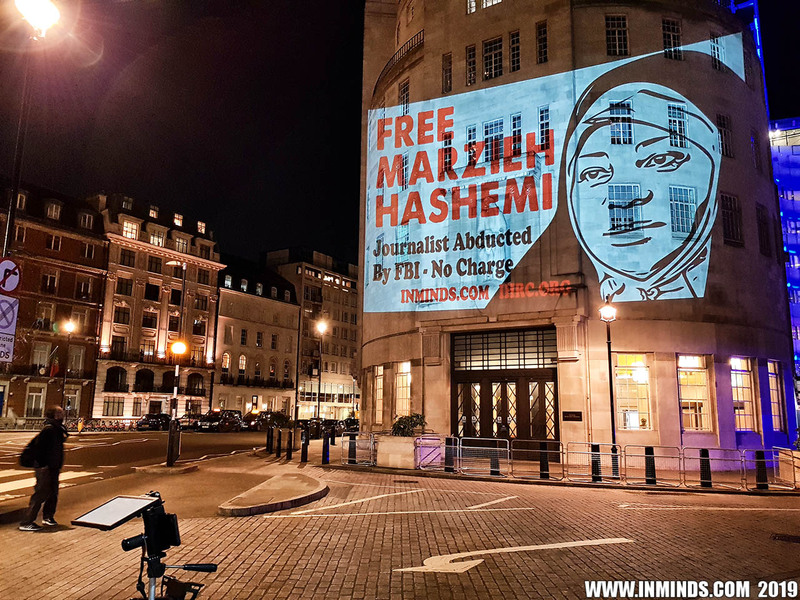 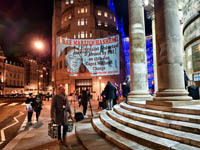 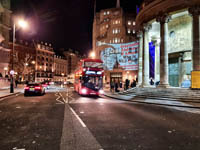 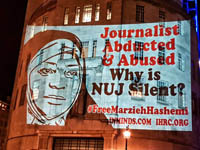 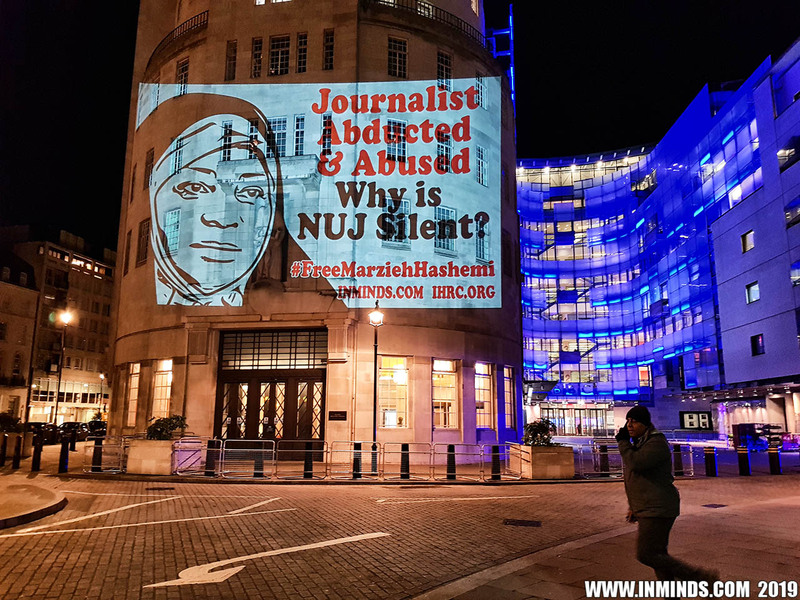 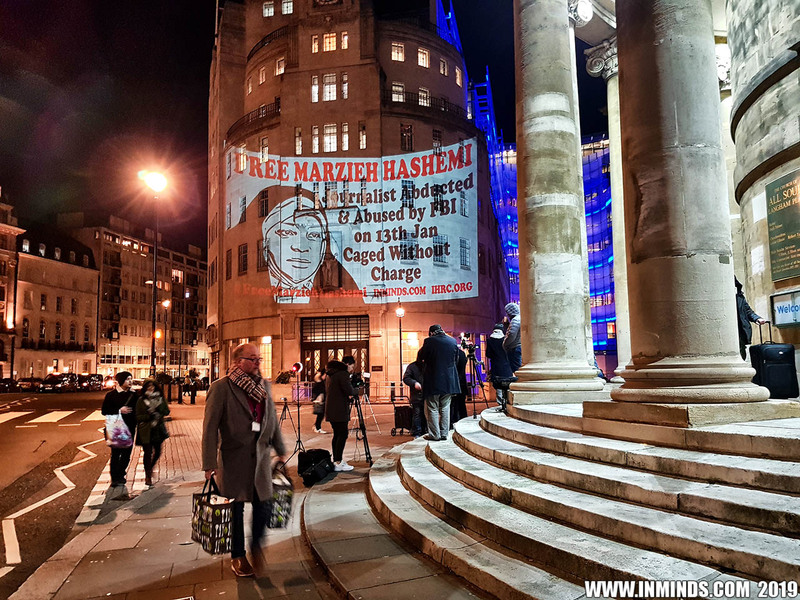 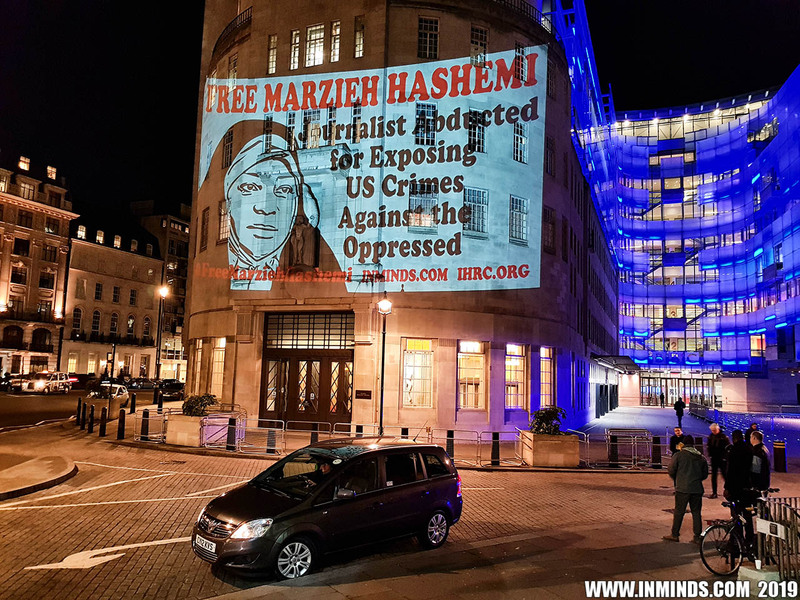 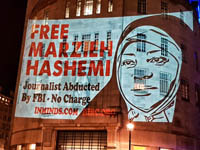 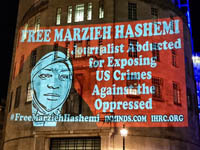 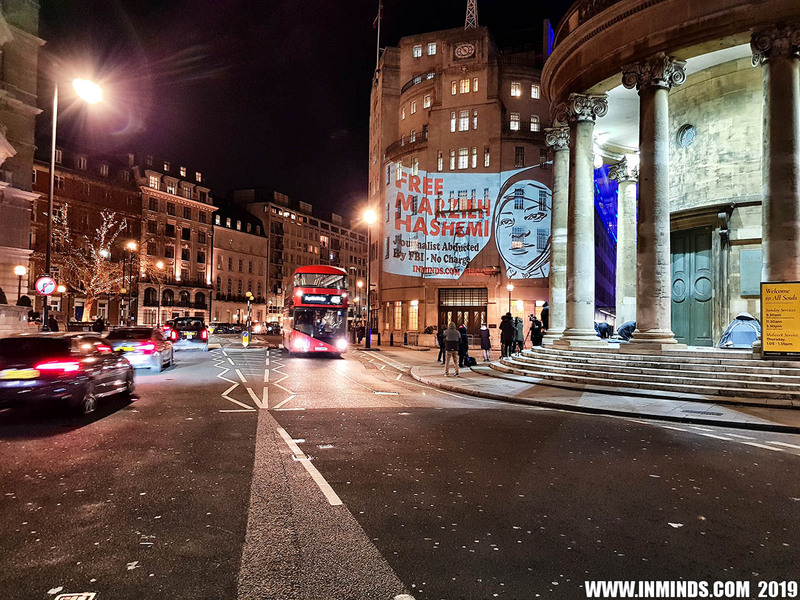 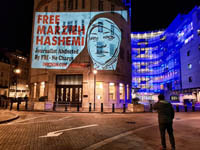 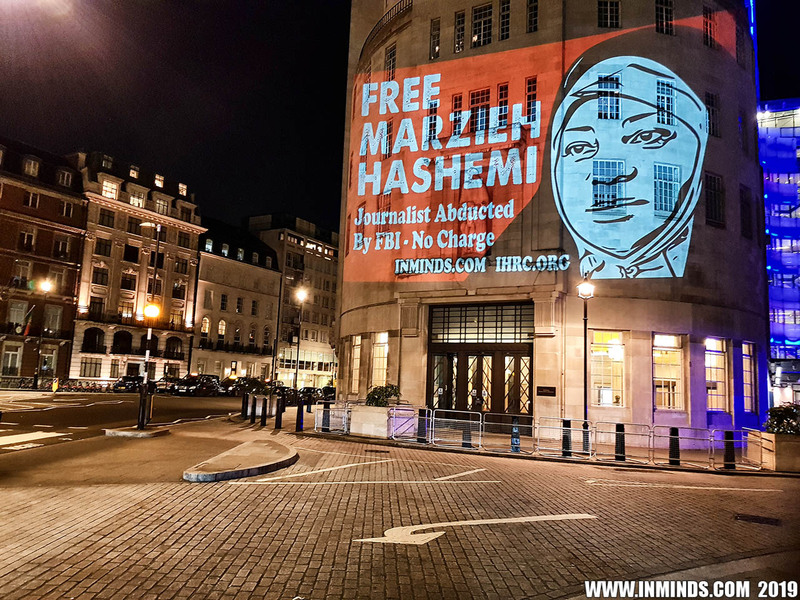 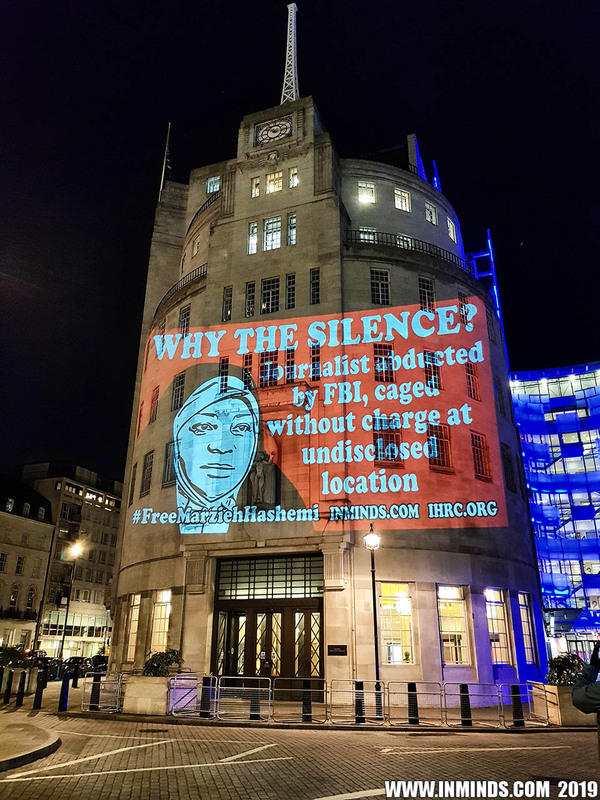 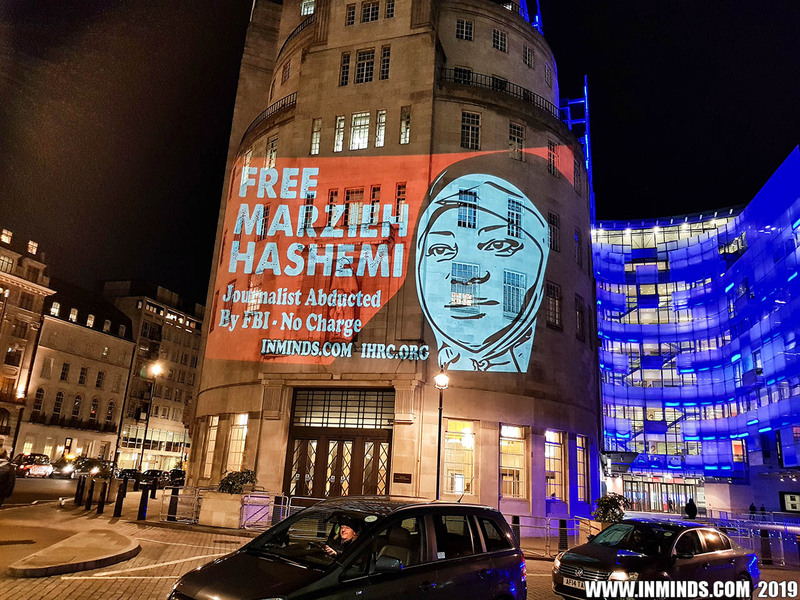 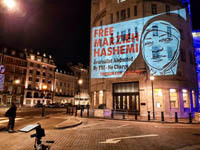 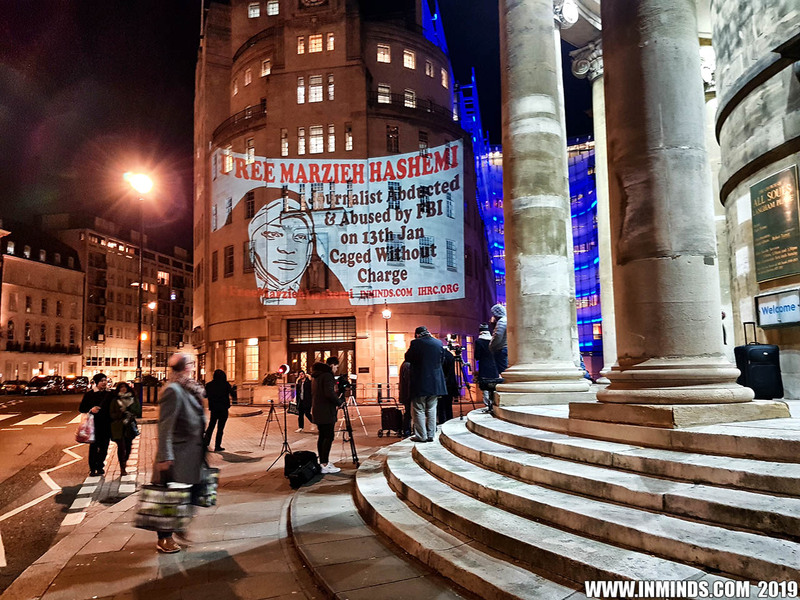 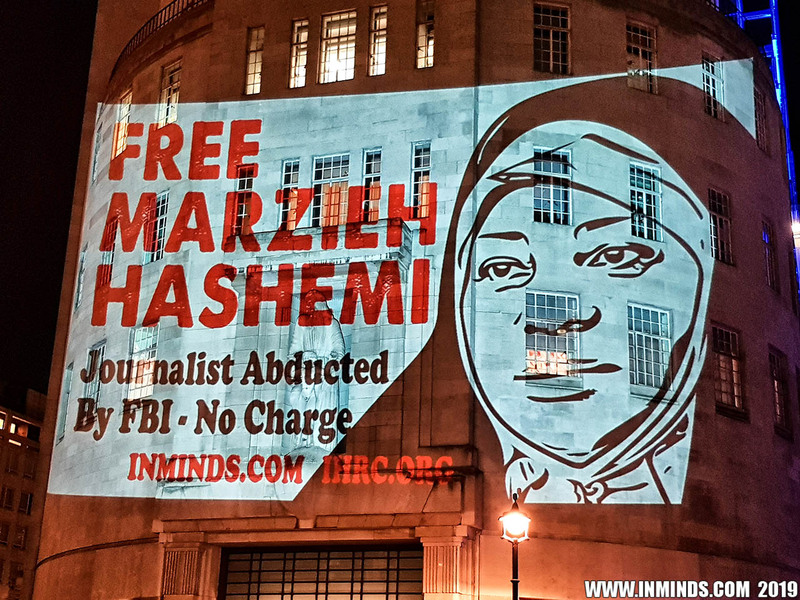 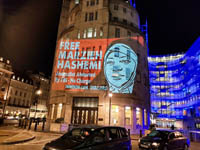 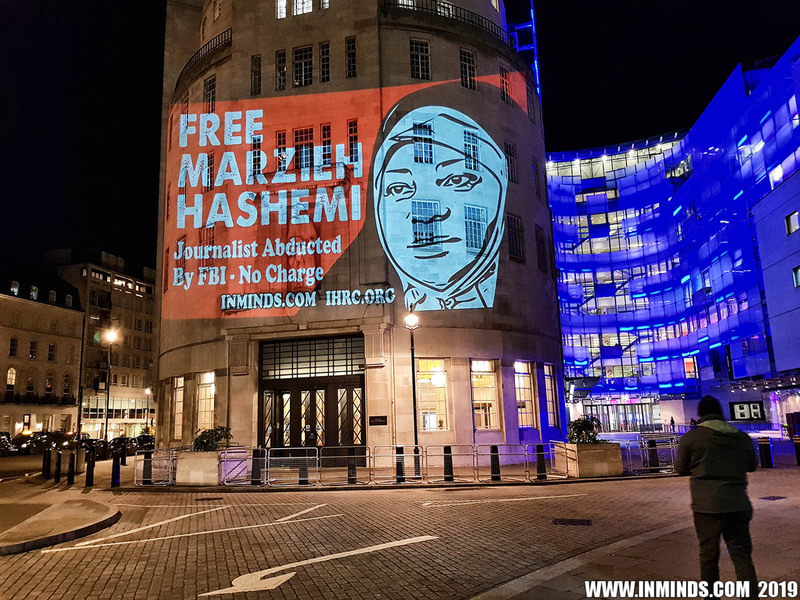 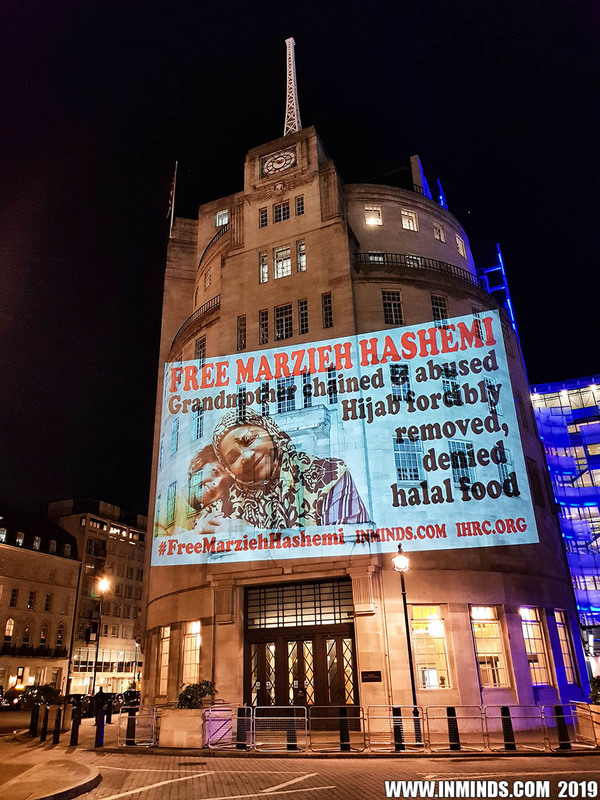 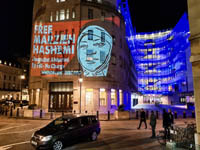 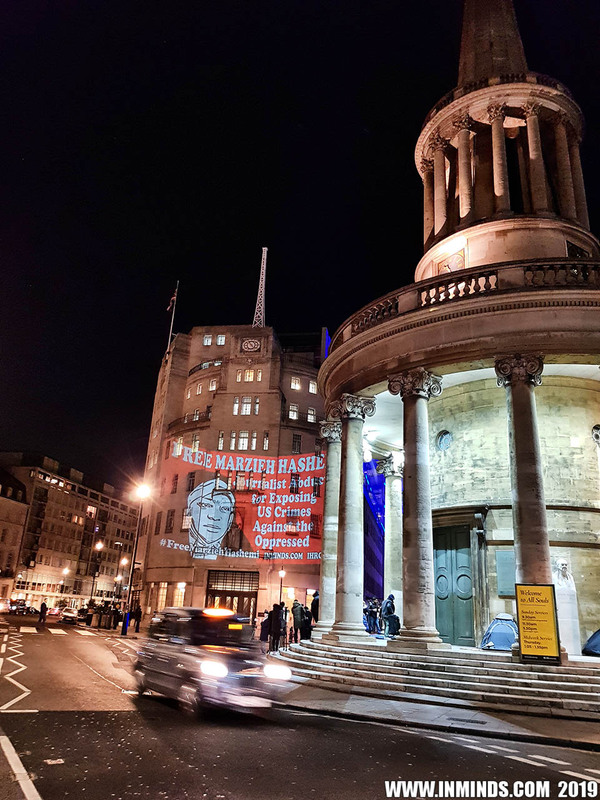 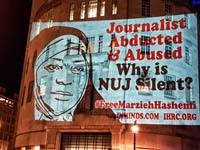 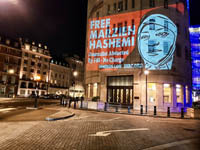 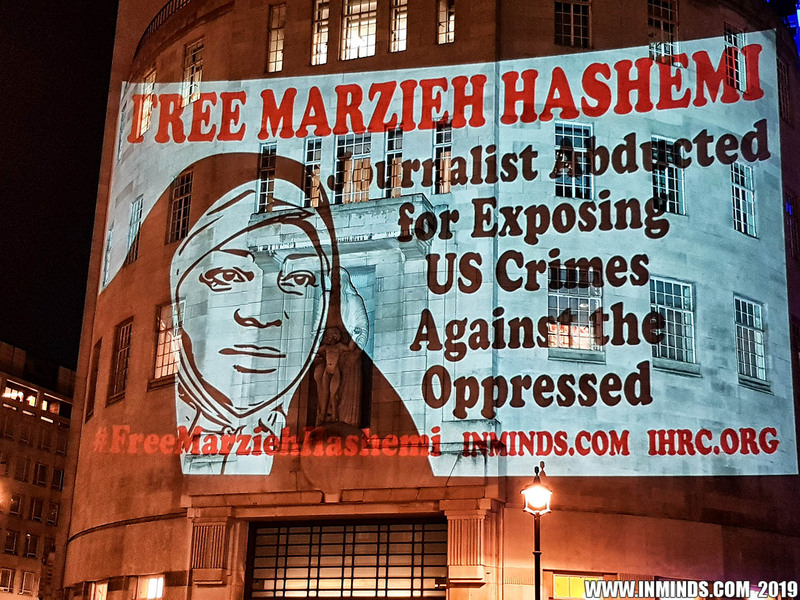 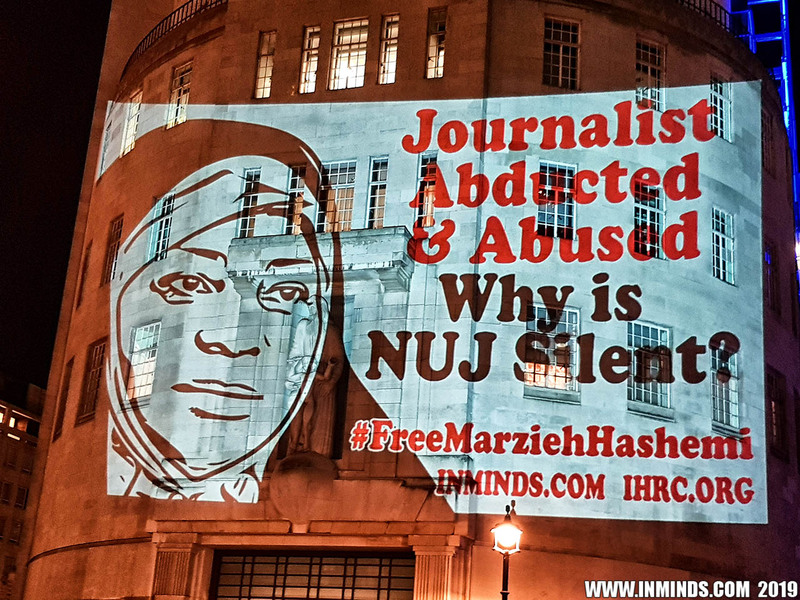 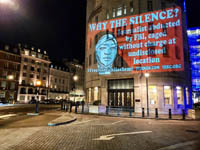 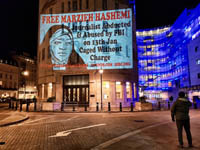 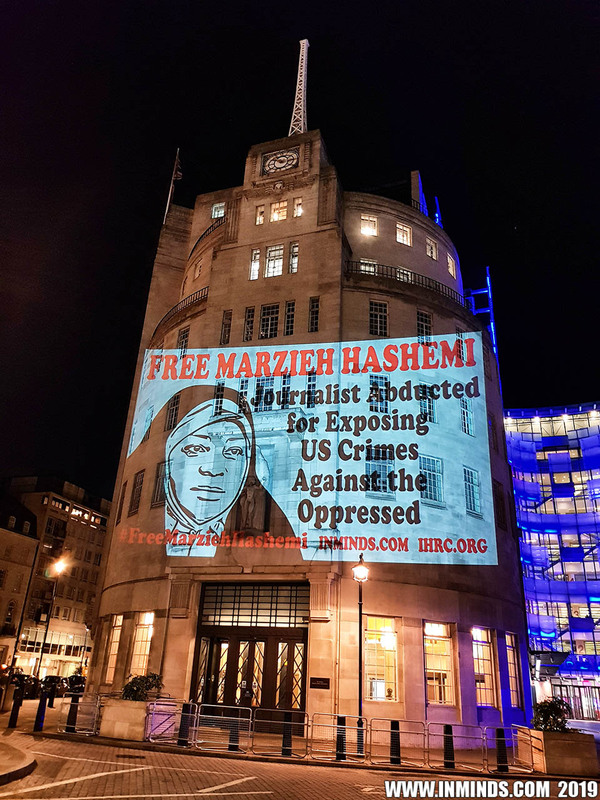 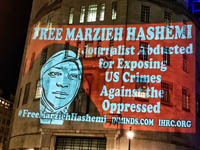 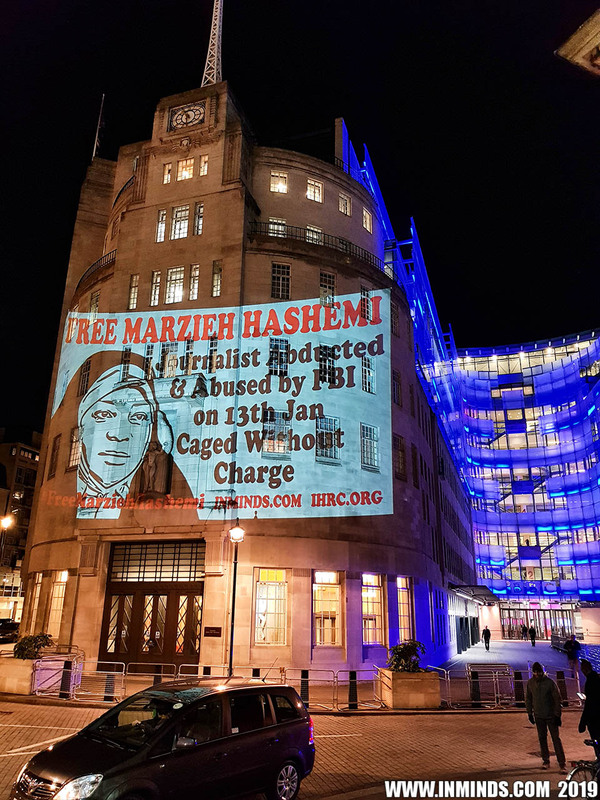 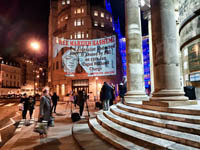 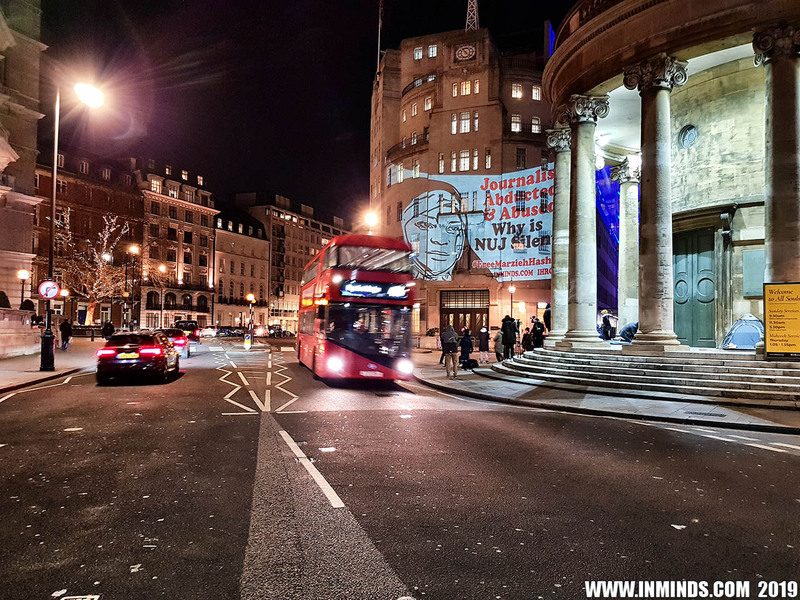 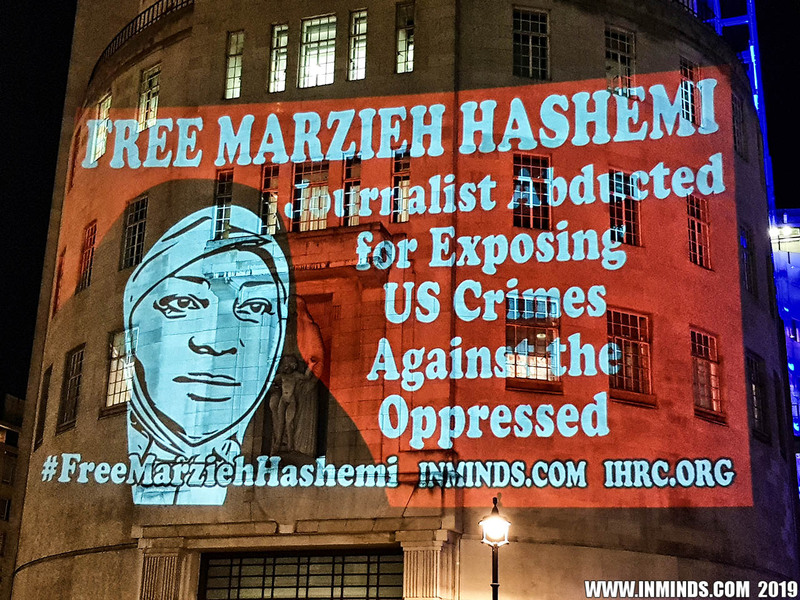 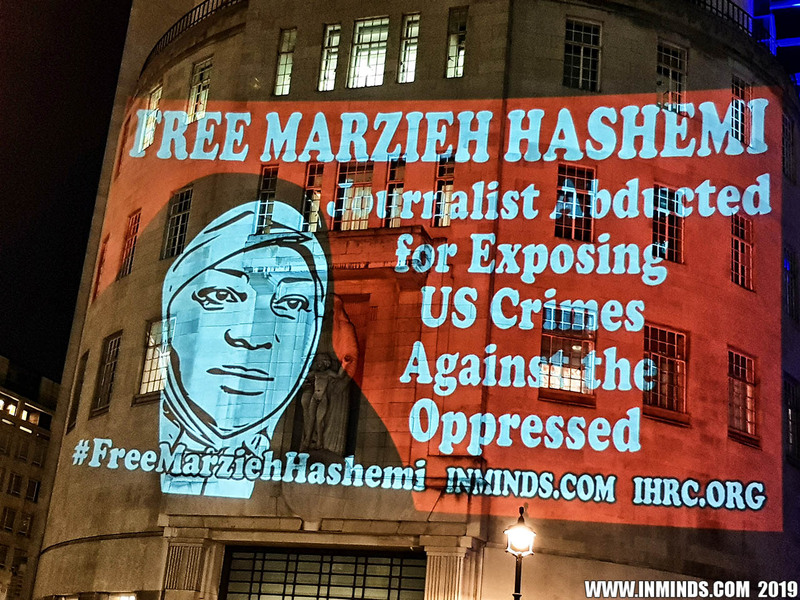 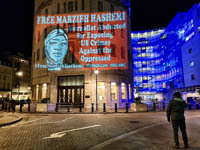 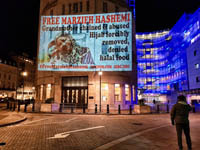 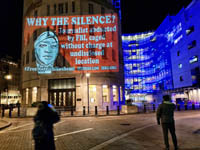 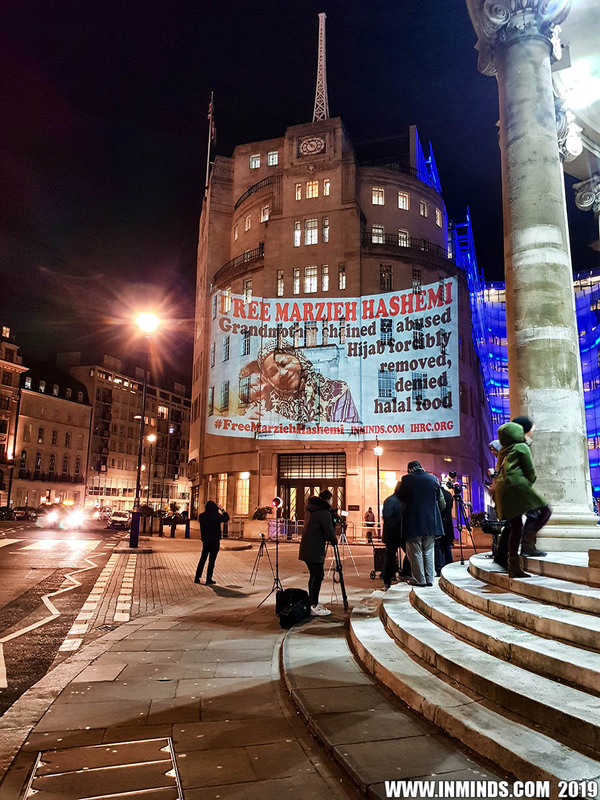 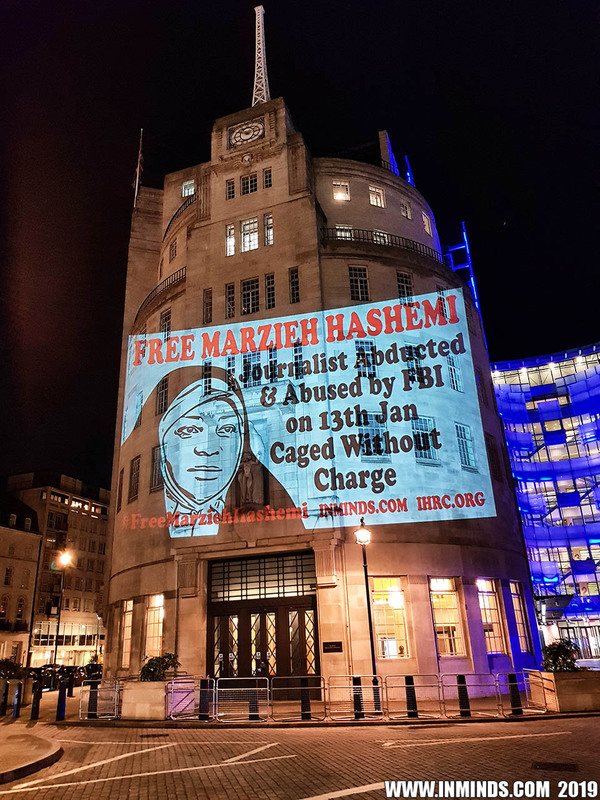 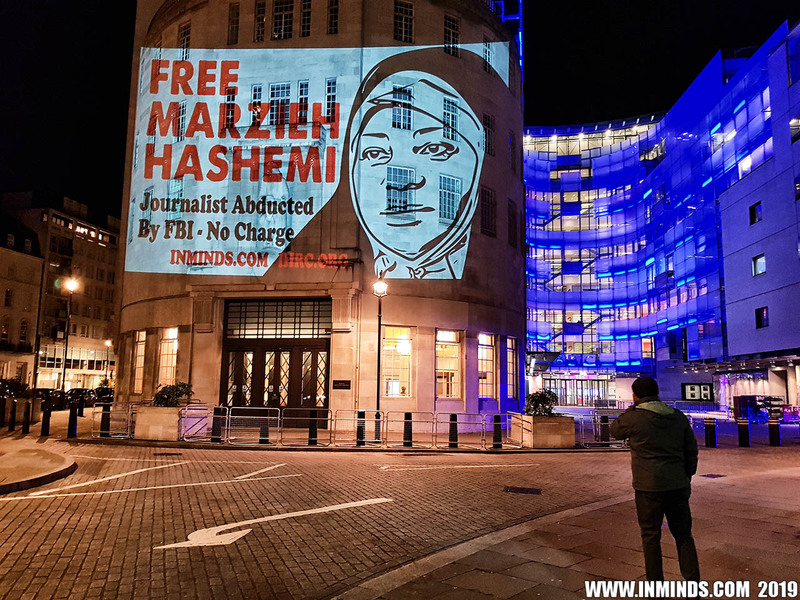 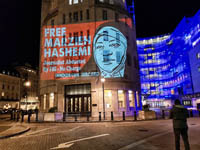 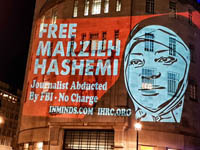 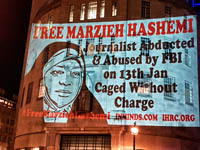 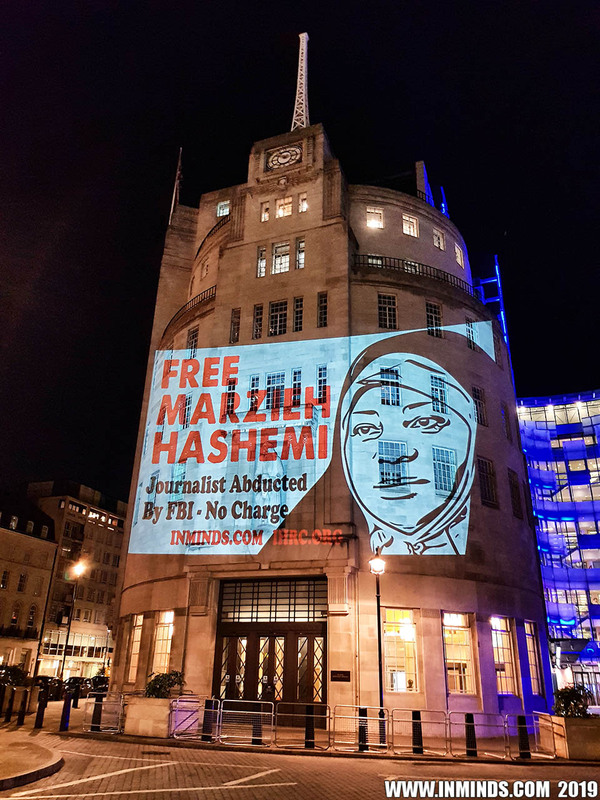 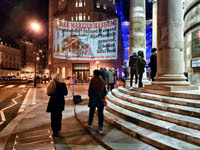 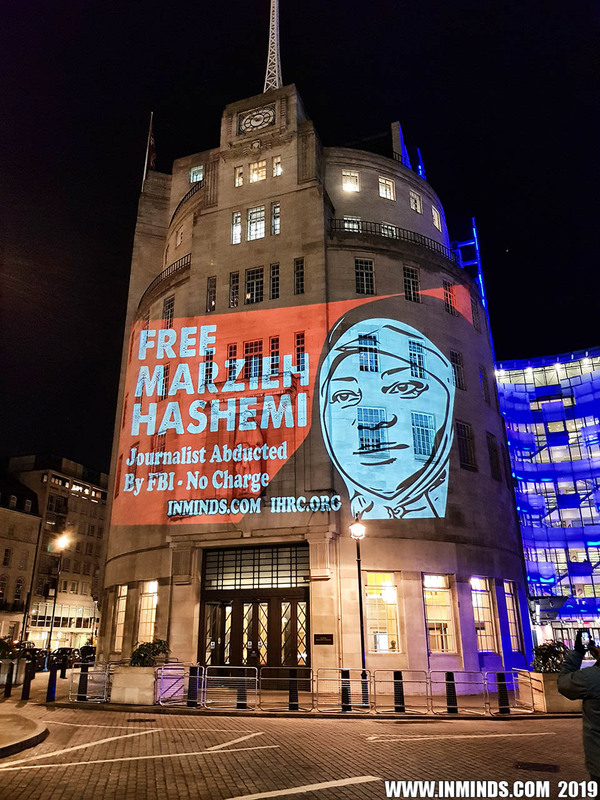 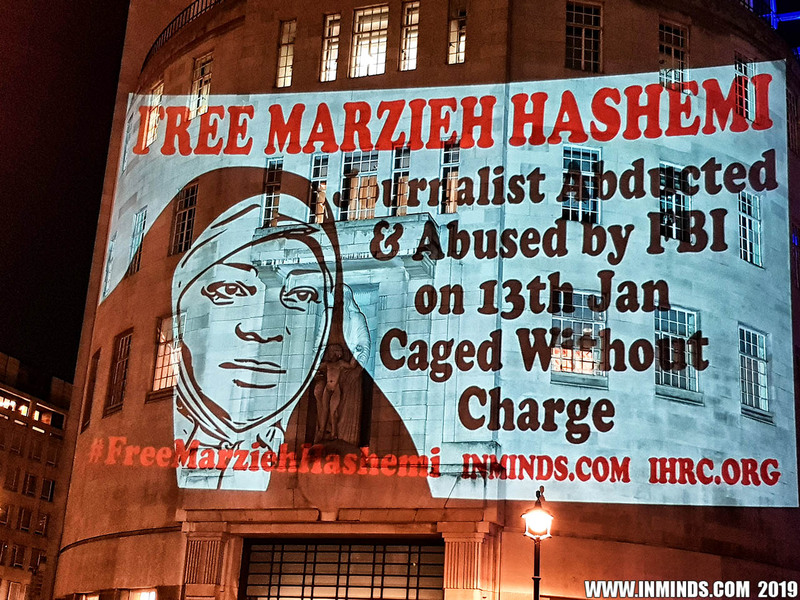 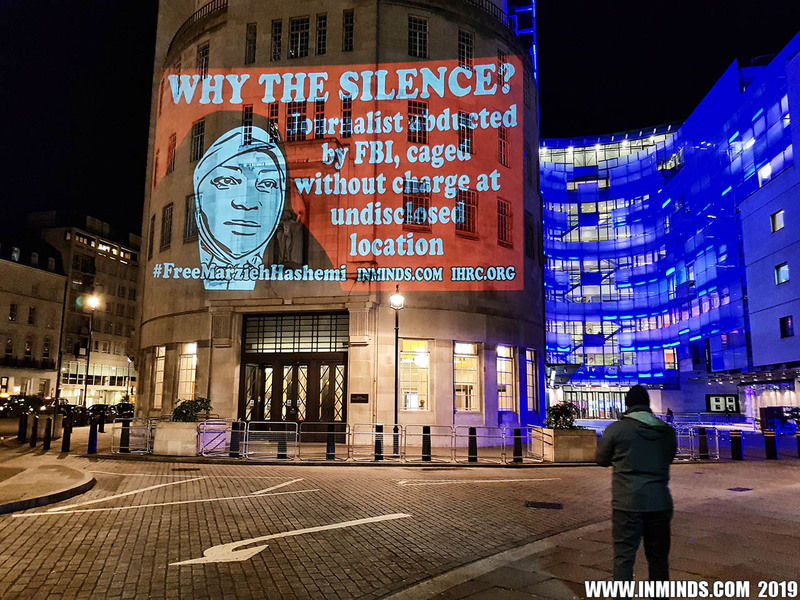 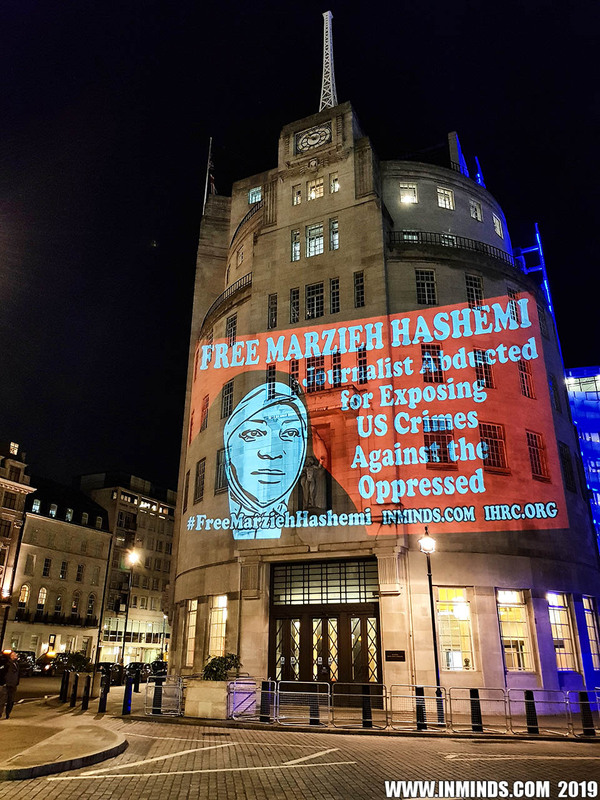 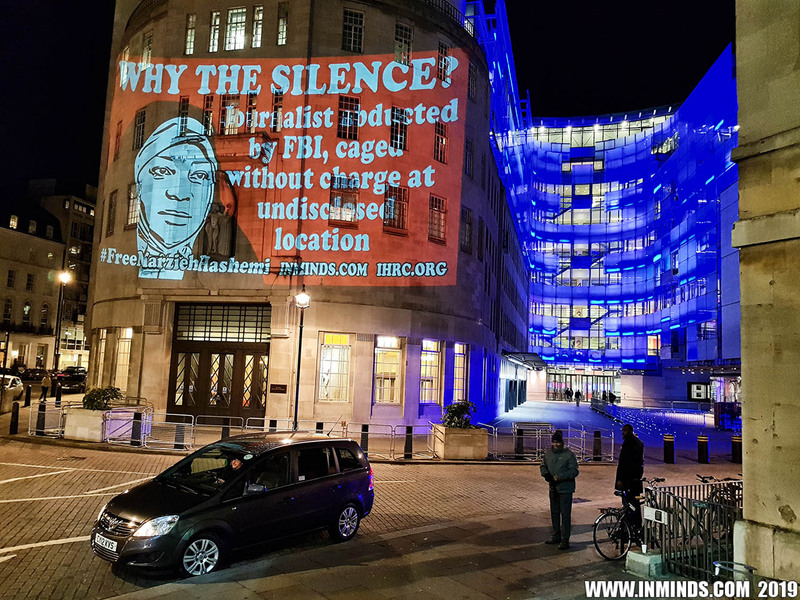 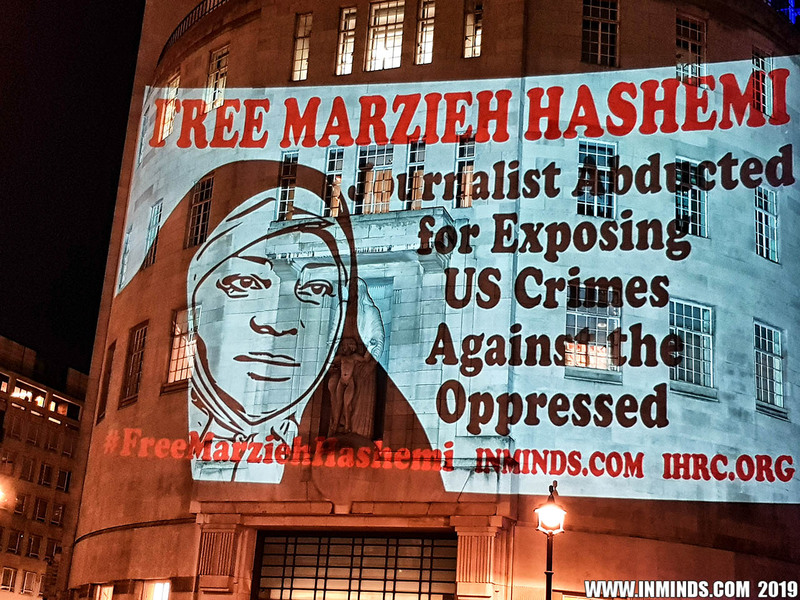 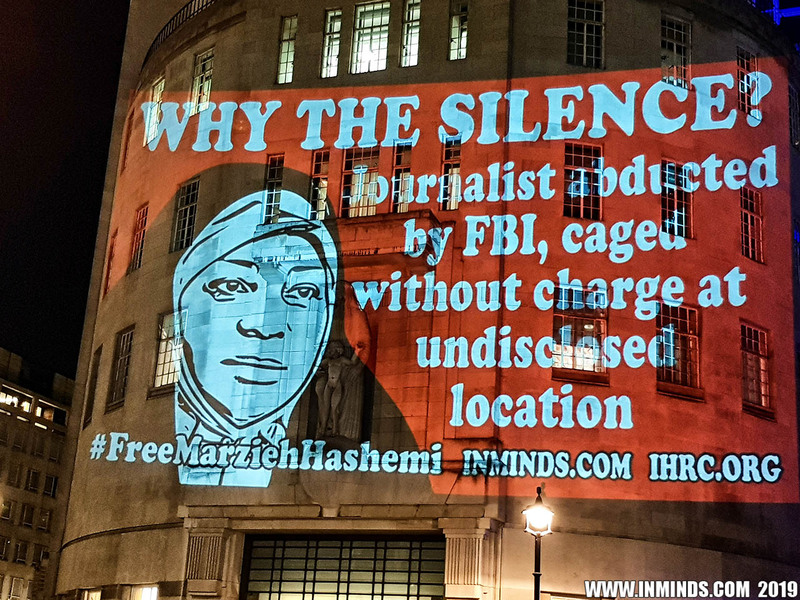 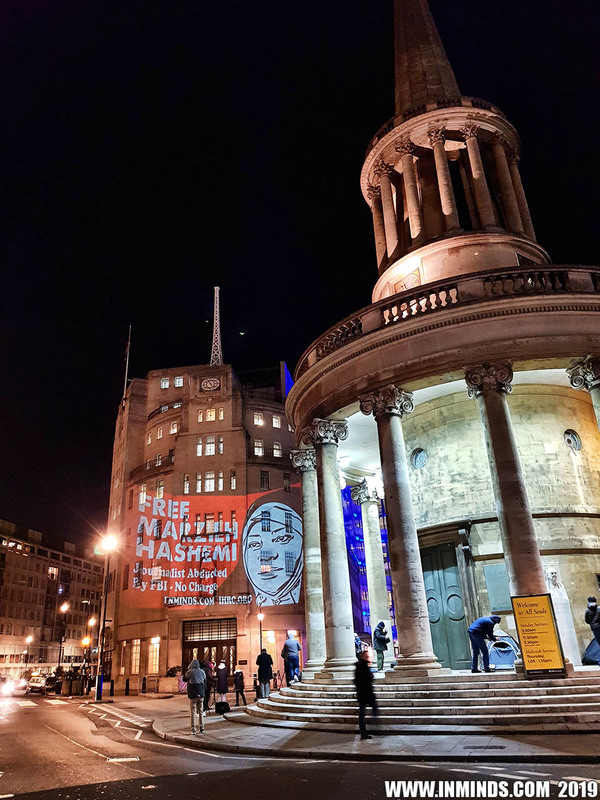 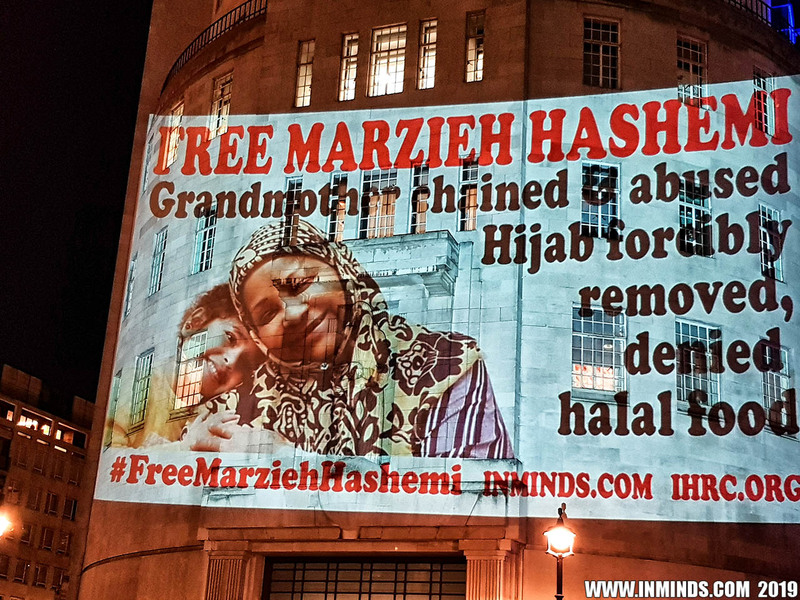 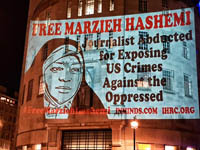 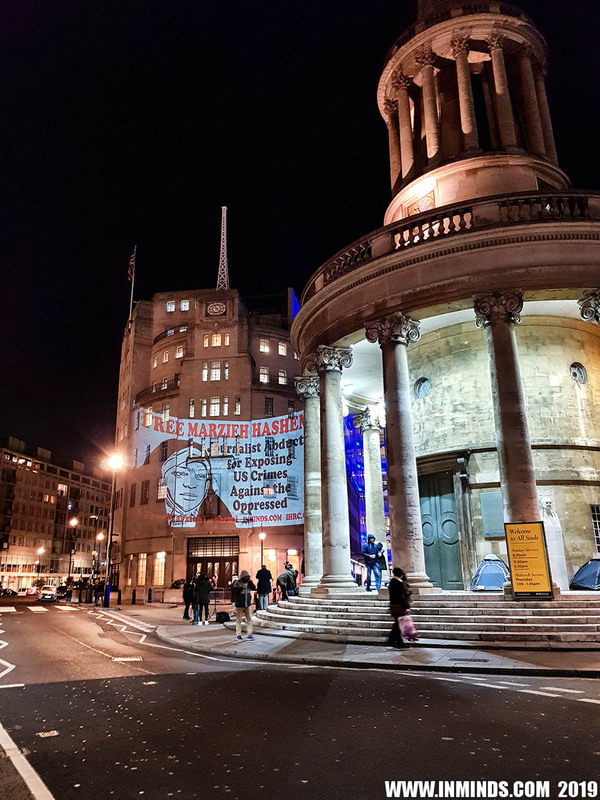 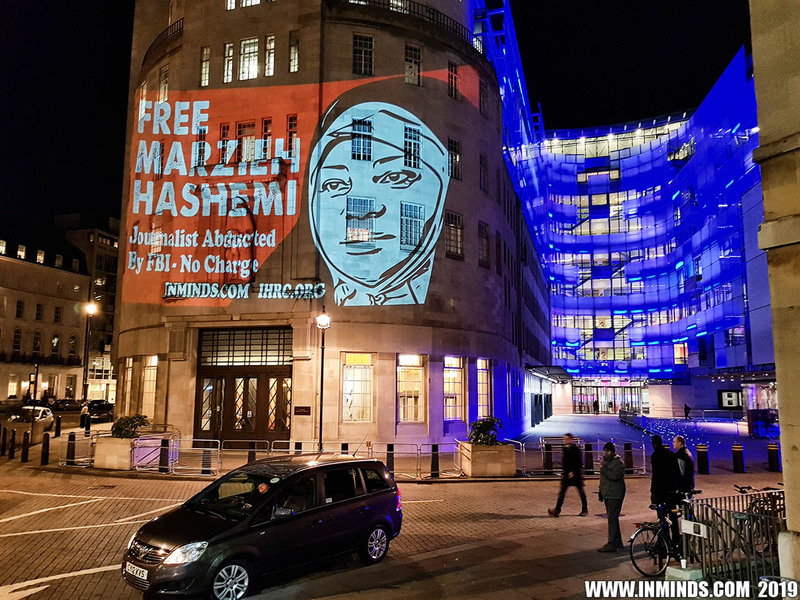 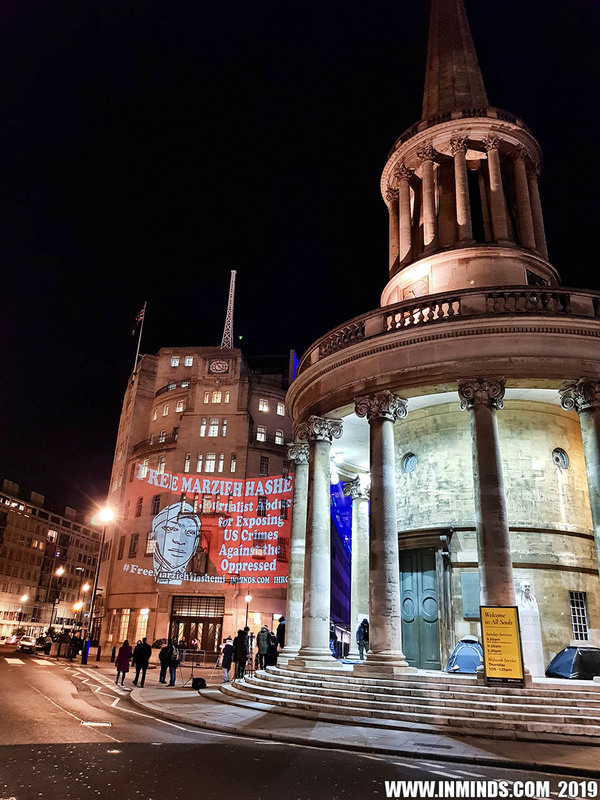 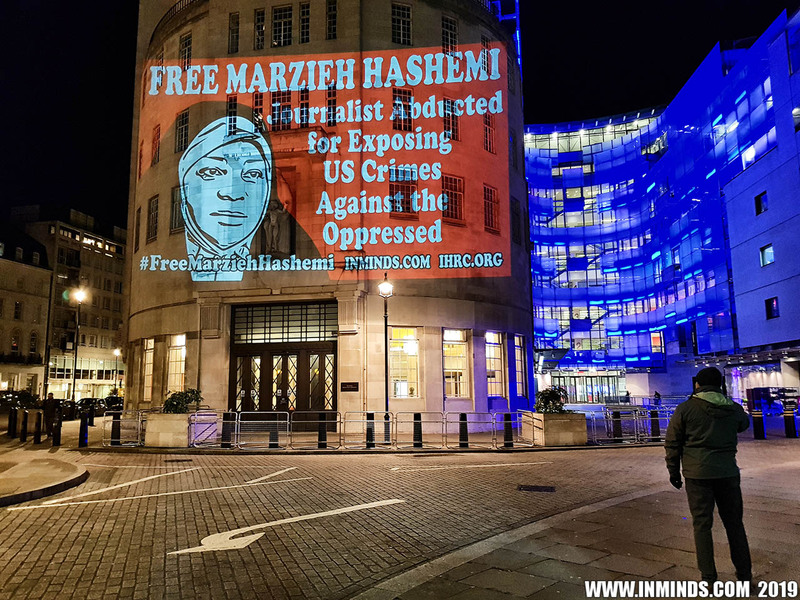 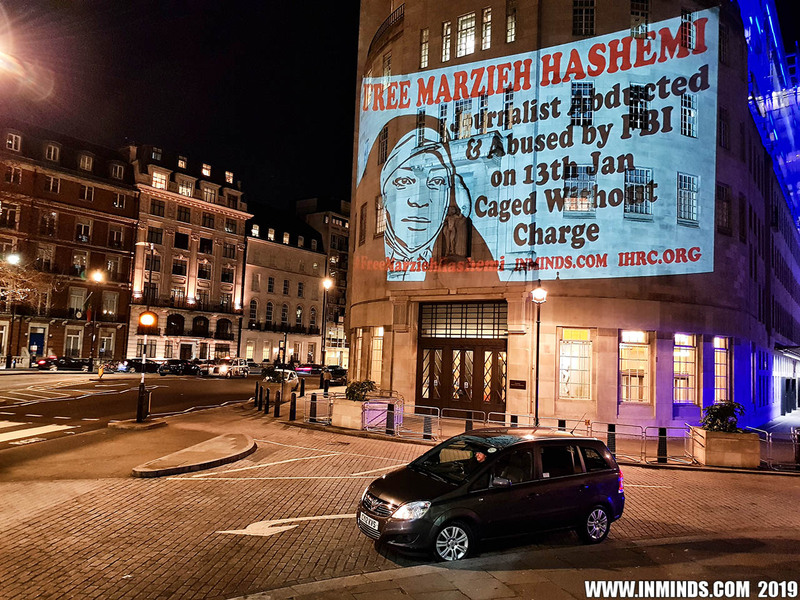 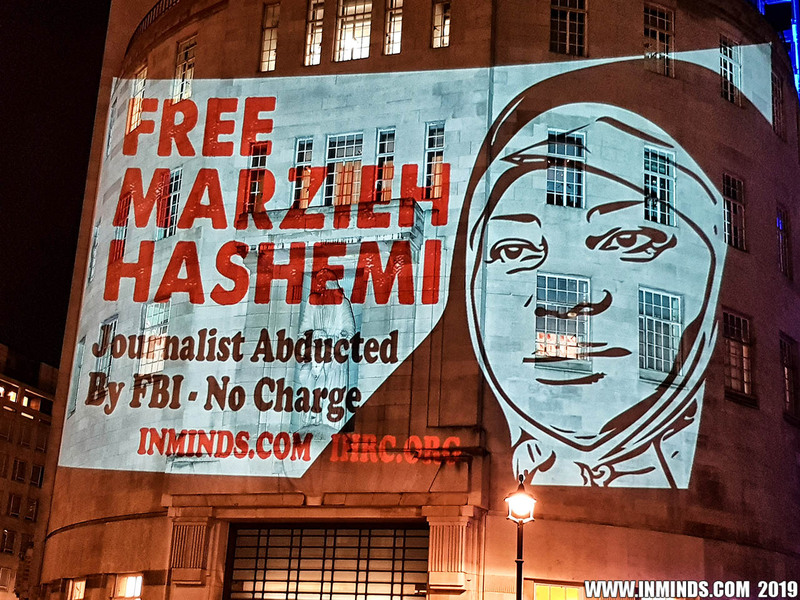 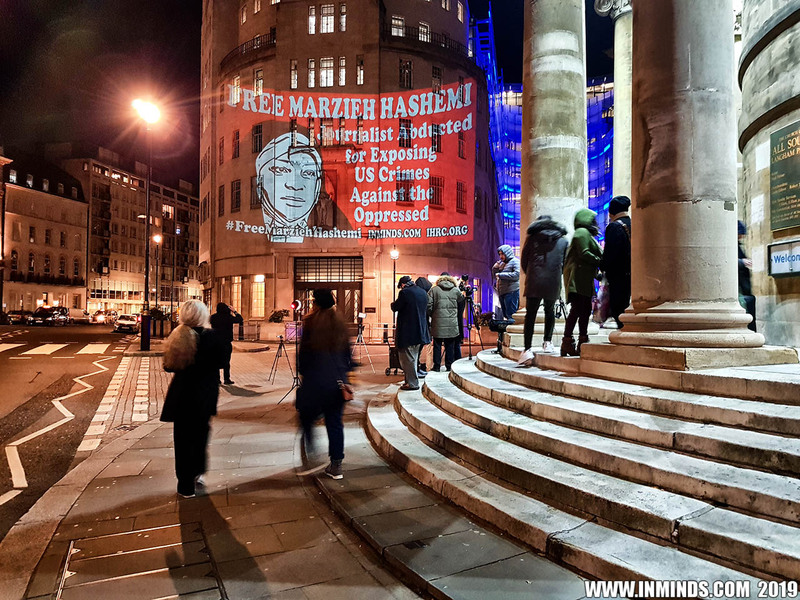 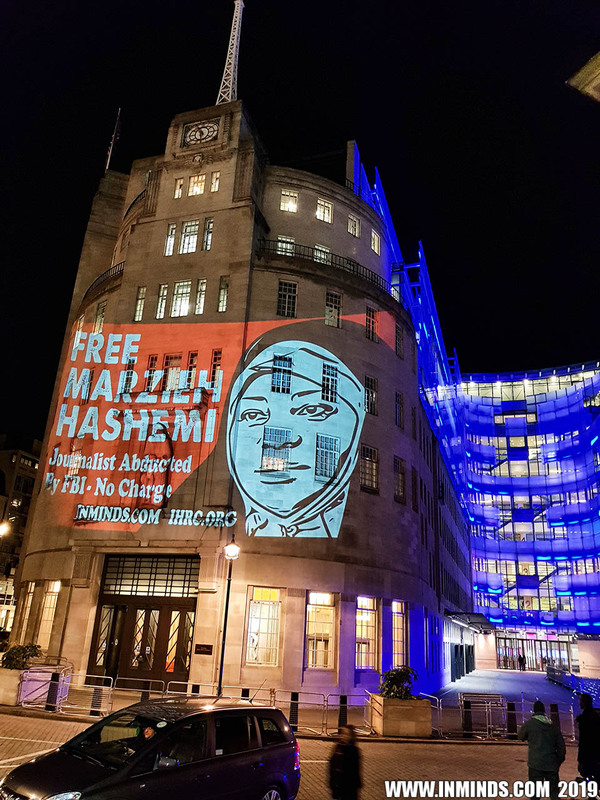 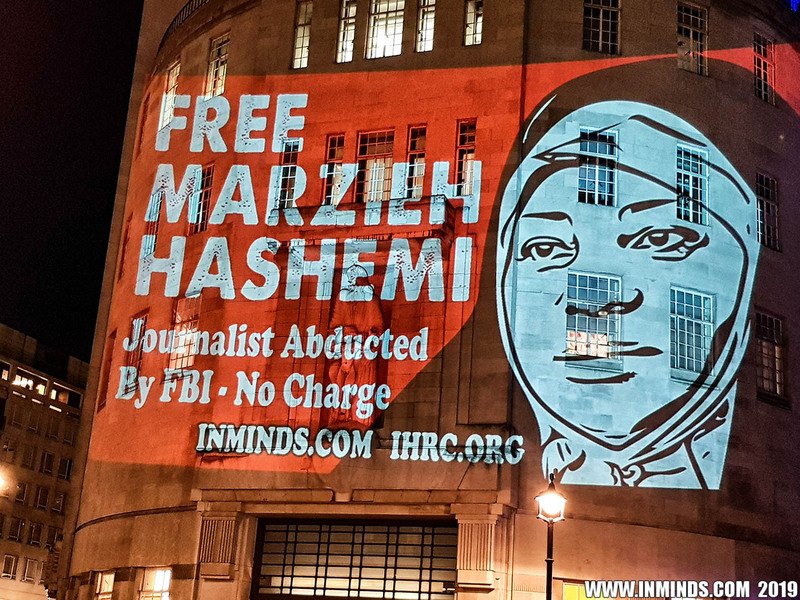 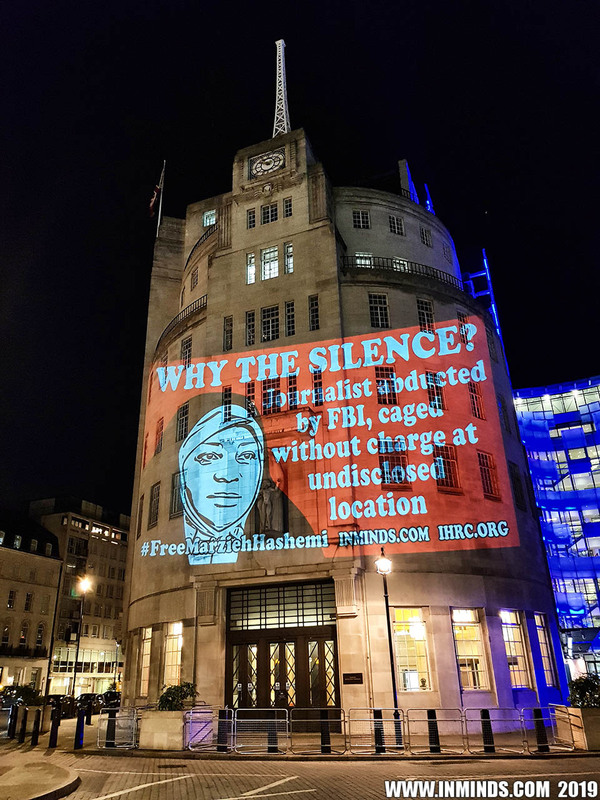 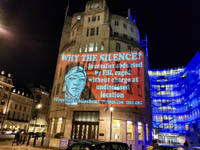 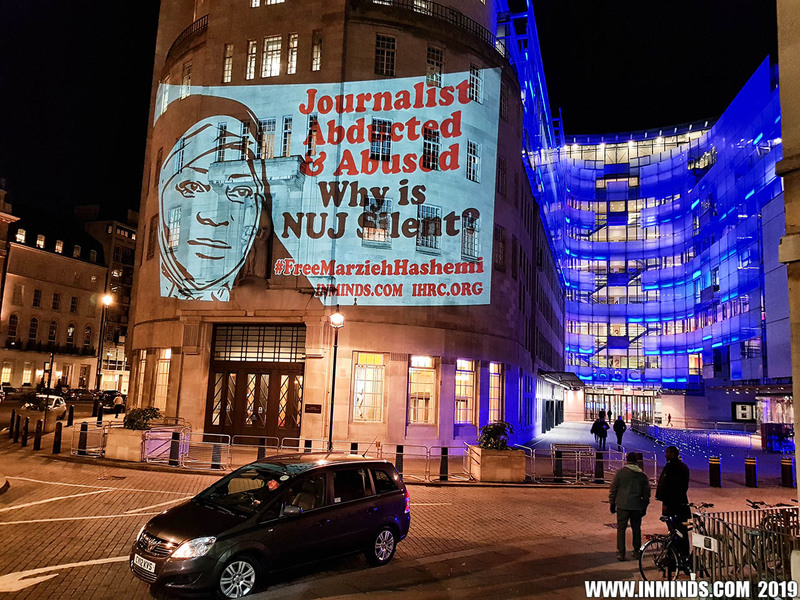 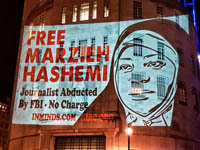 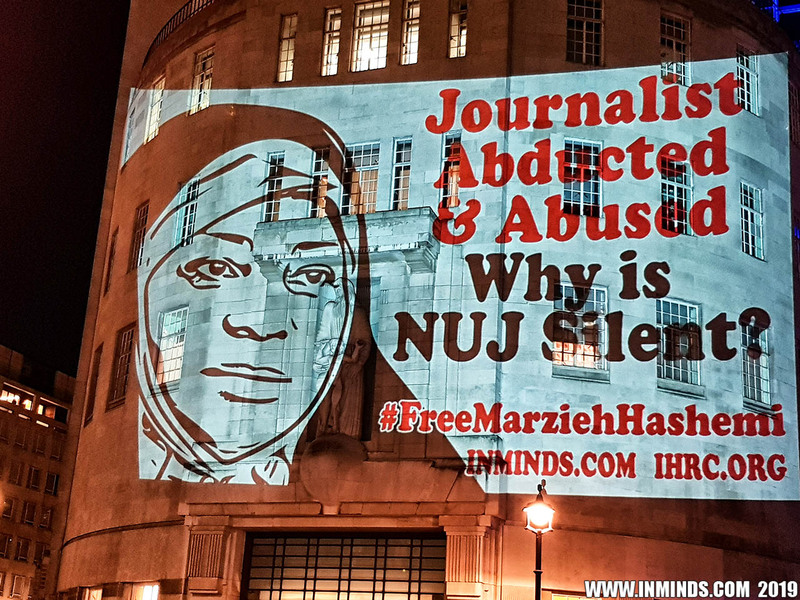 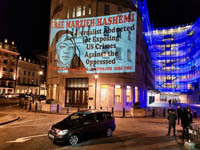 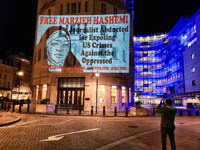 On Friday 18th January 2019 Inminds Human Rights Group along with the Islamic Human Rights Commission carried out a guerilla projection in solidarity with illegally imprisoned journalist Marzieh Hashemi, on the walls of BBC Broadcasting House, the iconic headquarters of news media in the UK. 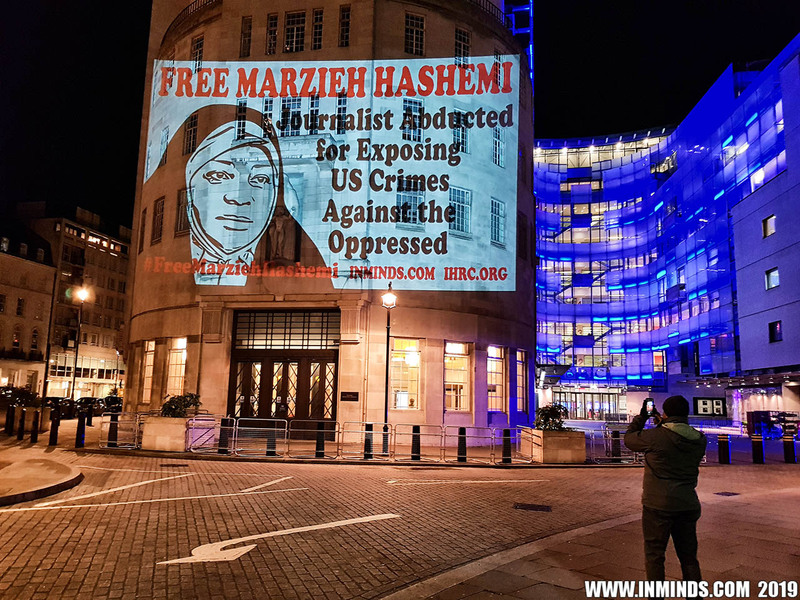 Outspoken African-American Journalist Marzieh Hashemi, who is news anchor at Press TV, was abducted by the FBI on 13th January 2019 whilst visiting her family in the United States. 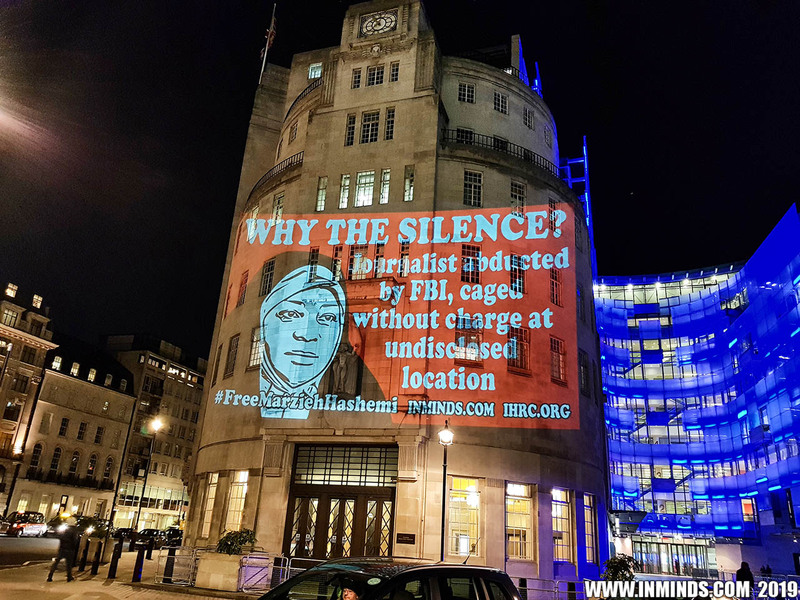 No reason has been given and she has not been charged with any crime. 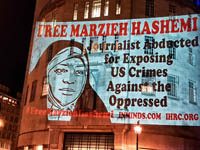 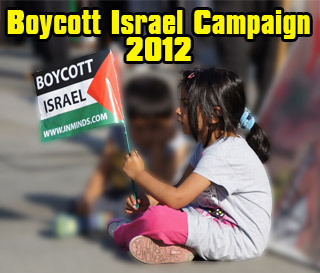 Both her hands and feet were chained and she was moved to an undisclosed location in Washington DC where she was caged. 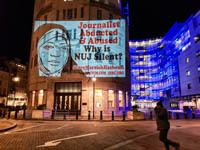 For two days she was not allowed to call her family, and when she finally did she reveal the abuse she had endured. 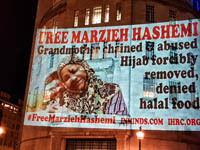 Her hijab was forcibly removed and she was forced short-sleeved clothing that does not comply with her religious dress code. 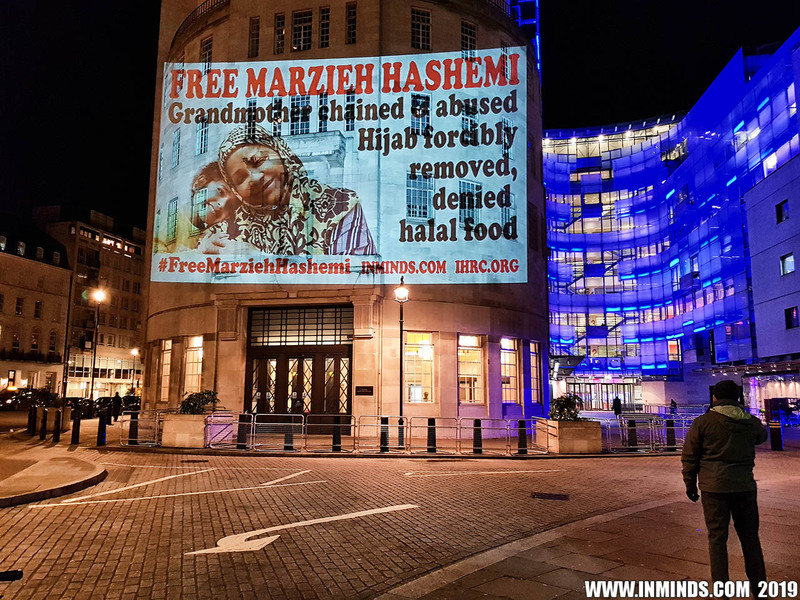 She is being denied halal or vegetarian meals, only being offered pork, effectively denying her food. 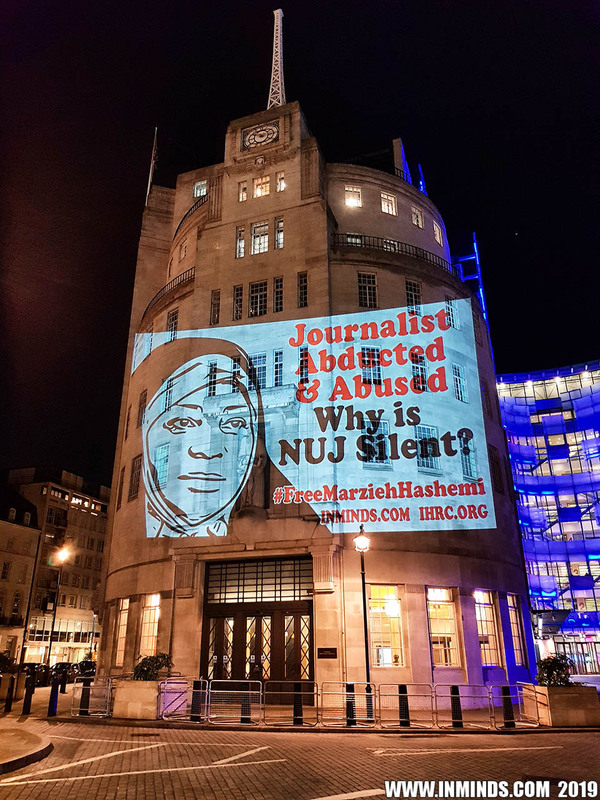 The projection demanded Marzieh Hashemi's immediate release and asked fellow journalists, news media, and in particular the National Union of Journalists (NUJ) why they are silent at the illegal detention of a fellow journalist? 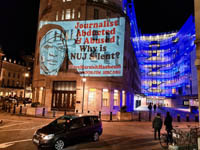 Whilst the International Federation of Journalists, Committee to Protect Journalists, and PEN America have all expressed some concern regards her arrest and detention, and the Switzerland-Based Journalist Support Committee has demanded her release, we have not heard any condemnation or concern from the NUJ. 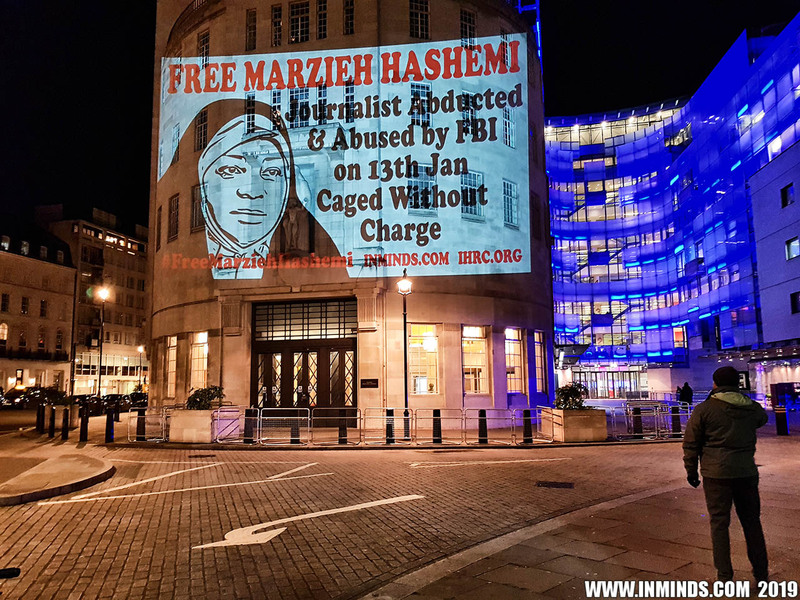 The partial unsealing of a court order, on Friday 18th January, confirms Marzieh Hashemi is not accused of any crime, but is being held under a 'material witness' warrant. 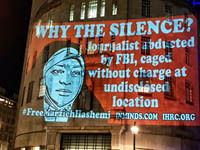 Since 9-11 the US has used so-called 'material witness' warrants to cage people with no charge, trial or even reason being given, for an indefinite time period. 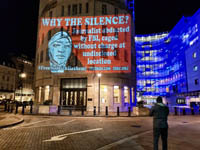 Analysis by Human Rights Watch and the American Civil Liberties Union in 2005 found that the government had held 70 men as potential witnesses and nearly half were never called to testify. 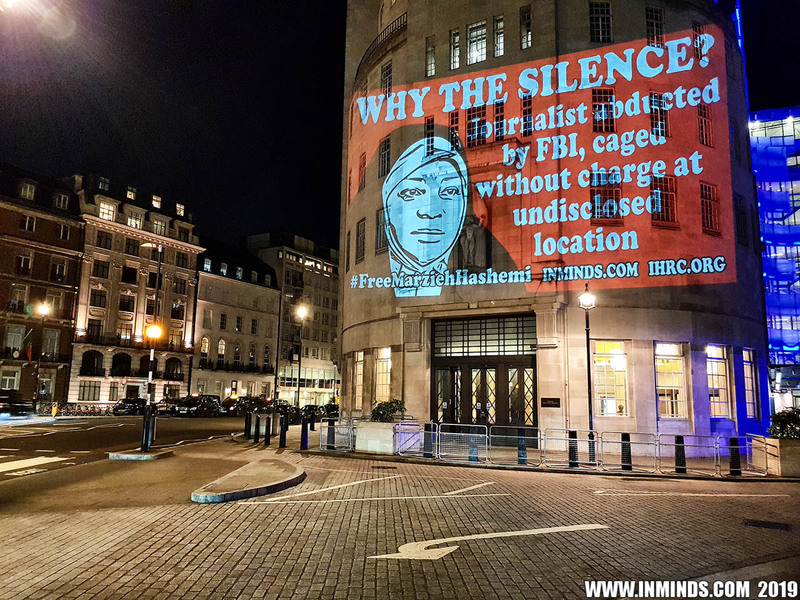 The report concluded the use of the warrants was excessive and frequently unlawful because many detainees were never questioned by a grand jury or were denied access to attorneys for extended periods of time. 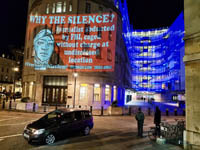 Most were never charged with a crime, the report found.